Organizations expend constant effort to deliver information employees need to know for their jobs. And oftentimes, there’s a lot at stake. You depend on training to help your employees make more sales, provide better customer service, avoid regulatory issues, and make fewer mistakes. But training has no value if we can’t retrieve the information we’re taught. Training reinforcement is essential to ensure that knowledge and skills learned in training are applied on the job. If you are new to training reinforcement or a bit unfamiliar, here are seven key things to know. Think of these facts as tips that will help your learners recall the right information when they need it. 1. The goal of training reinforcement is to beat the forgetting curve. 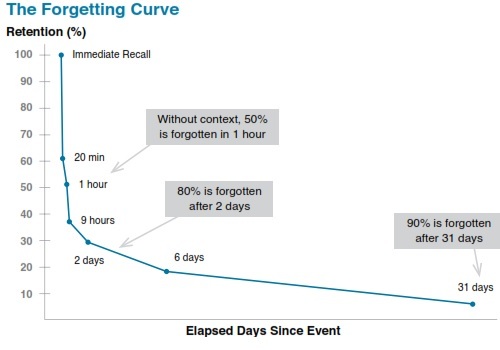 There are lots of reasons why it’s difficult to overcome Herman Ebbinghaus’ forgetting curve. His original research, which has since been replicated on several occasions, shows that our brains are wired to forget things without repeated exposure and practice. Essentially, learners can forget up to 90% of what they learn without reinforcement. It’s not a pretty statistic. 2. Training reinforcement should be designed based on the science of learning and remembering. Below, I mention some exciting new learning tech trends you can use as part of training reinforcement. But before we get to that, we have to understand what makes these technologies useful for learning. 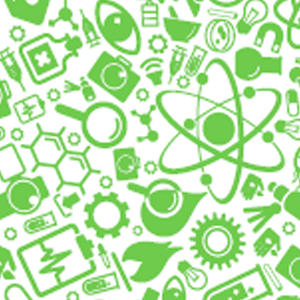 We must consider the importance of learning science – the backbone of sound instructional design. You can invest in all the flashy new technology in the world! But if you design training reinforcement without considering the underlying science of how the human brain retains information, you put your training efforts at risk. Spaced repetition and distributed practice, for example, are significant components to help someone actually use what you are trying to teach them. Information that is presented over spaced intervals is learned and retained more easily and effectively. Retrieval practice is another good example. The more your learners have to “retrieve” or call information to mind, the less likely they are to forget it. For this reason, it’s important for employees to experience training on the actual job site and not just in the classroom. 3. 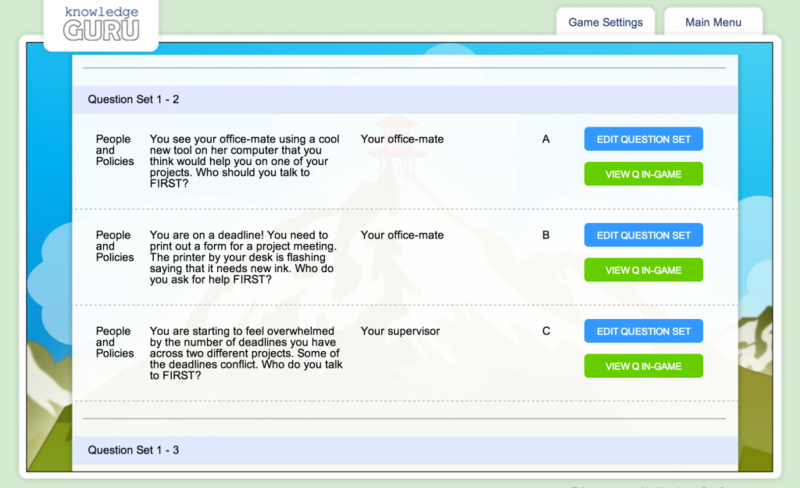 Games and gamification can make training reinforcement more motivating and engaging. The struggle is real… we know it’s a constant battle to create solutions that actually motivate your learners to take training. But it doesn’t have to be this way. 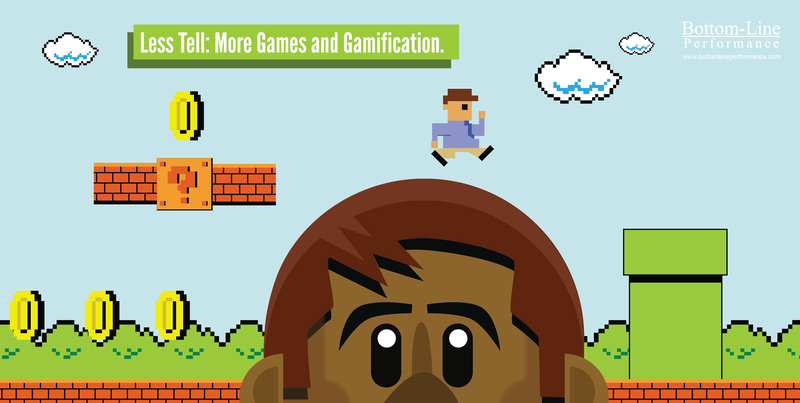 It may be time to “up your game” with games and gamification. 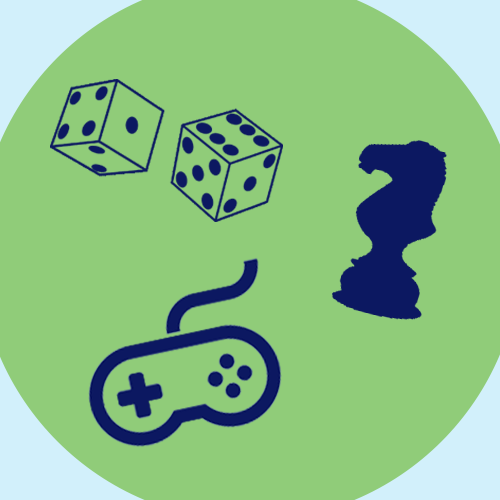 Our 2018 Learning Trends Report revealed that more and more L&D professionals are actually including games and gamification in their training. We see game-based learning as having wide application across many delivery options—mobile, Virtual and Augmented Reality (VR and AR), eLearning, and even old-fashioned Instructor-Led Training (ILT), live and online. This could be a “game changer” for your organization. 4. Mobile is often the ideal delivery method for training reinforcement. Once your training event is over, your learners need to be able to access information quickly and easily. What better way to do that than by making reinforcement available on mobile devices? Apps can be awesome reinforcement tools to support live or online training that is more “traditional” (e.g. take it on a laptop, click through lots of content). 5. Adaptive learning can personalize training reinforcement to learners’ individual needs. The more personalized your training reinforcement is to each learner, the more effective your overall training initiative will be. We built our Knowledge Guru Drive app as a training reinforcement tool to help learners build both confidence and competence. 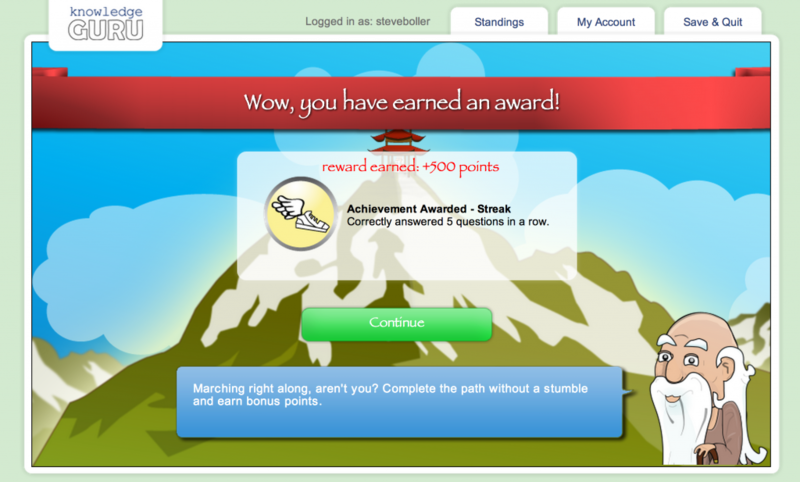 In the app, learners complete a short confidence assessment, then receive customized mini-games they play each day. Drive adapts to learners over time to help them master their weakest areas and build on their strengths. 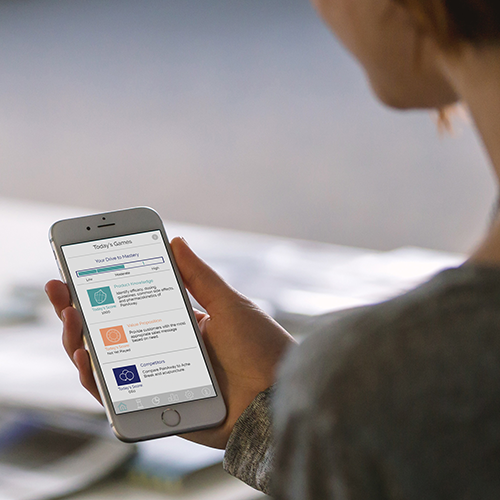 Drive’s confidence assessment allows you to accurately gauge your learners’ confidence in key areas and grow it alongside their knowledge and skills. of the Knowledge Guru Platform. 6. Conversational AI is opening up new possibilities for training reinforcement. Artificial intelligence is here, the devices are readily available, and there are plenty of use cases where it makes sense for training reinforcement. You could consider creating an app, for example, where learners can ask questions about a particular product or process and get quick answers. Voice commands could help sales reps out in the field who need a quick answer while driving to meet a customer. You can also create a chatbot that answers common questions via text. For example, a learner could text the bot a question and receive an answer without having to log into the LMS to look for it. You can even program the bot to forward questions it cannot answer to your training team for further support. 7. Training reinforcement needs to be carefully positioned as part of the learner’s overall experience. When you design a training curriculum, you want to create a cohesive experience that is beneficial to your learners from start to finish. 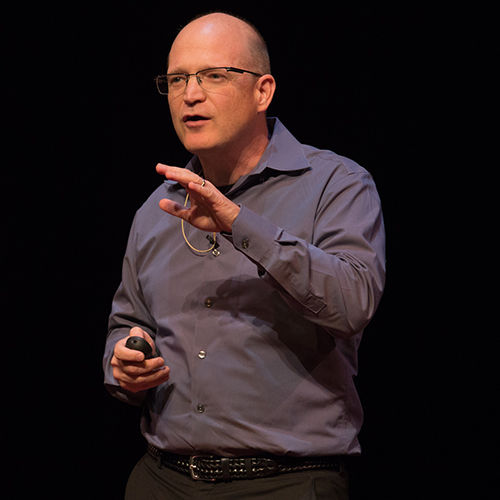 So how do we get to an optimal learning experience? How do we bring the target learner back into the design process in a way that is actually feasible for a business? A blend of traditional instructional design with design thinking tools may be part of the solution. Design thinking produces solutions through an iterative process of observation, insight, ideation, experimentation, and testing. Its goal is to create solutions that find the sweet spot between learner needs and preferences, business needs and the technology that’s most viable. In our upcoming webinar, Learning Trends in 2018: Present Realities vs. Future Possibilities, we will provide an in-depth analysis and discussion of this year’s trending tech and training solutions. Few topics get people less excited than insurance. Some cringe in frustration. Others yawn with boredom. Yet we all know in our heart of hearts that insurance is a necessity. This is especially true if you have experienced a major “hometrastrophe,” been rear-ended or needed an expensive medical treatment. Many organizations think of their training as a form of insurance against things like poor employee performance, regulatory fines, and the risk of talented employees leaving their organization. 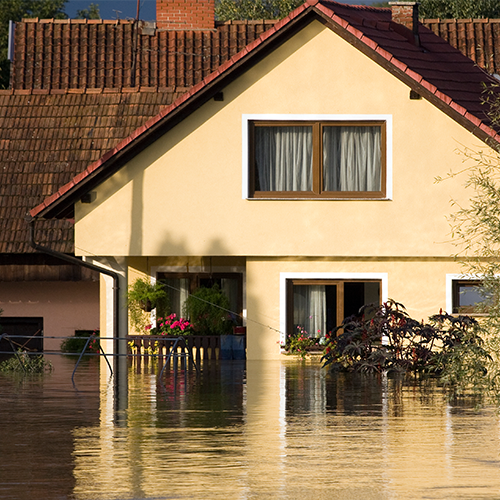 Organizations collectively spend billions of dollars on this insurance. But how do they make sure that all of this training is doing what it’s supposed to do? What’s the point of even having training if your learners can’t remember what they need to be successful? What’s the impact if they can’t stand taking the training? Just like we all hope to avoid the scary surprise that a major accident or prescription drug is in fact not covered by our insurance policy, organizations would do well to make sure the insurance they are buying (training) does what they need it to do. Here’s the honest truth: training won’t get you the results you want unless you include training reinforcement in your overall design. Traditional training is typically conducted in an event-based model. The course is sent out… and learners complete it. Sales reps fly in for the national sales meeting, learn about this year’s new products… and then return to their territories to keep doing things the same way they were before. Reinforcement breaks this cycle by turning the event-based model into a campaign-based model. Instead of thinking about individual events and courses, trainers plan an extended campaign that includes multiple touch points, reminders and review opportunities. Access our webinar recording on Reinforcement 101: How to Help Reps Say and Do the Right Thing to identify the best training reinforcement strategy for your organization. There are many different tools and reinforcement methods available to help you, depending on the learning need. The approach you choose should depend on whether you need learners to find and locate what they need or recall it from memory at the moment of need. Most training reinforcement programs incorporate tools that support both of these needs. Performance support is easy to understand. After training is over, you want your learners to be able to look up the information that was covered. But what good is a SharePoint site if learners can’t easily access it on their mobile device? Are they able to easily search for what they need? What good is a support PDF if it is already out of date the moment you email it or paste the link in your LMS? Need learners to perform a skill or deliver a specific message to a customer without looking it up? You should plan a reinforcement program that incorporates spaced repetition. Numerous studies have shown that learners retain more information when they have the opportunity to review and relearn it multiple times over several days or weeks. Spaced repetition is especially valuable when you want to make sure sales reps are all delivering the same message or employees know the right steps to follow in a frequently performed process. Microlearning and spaced repetition often go hand in hand. It allows you to reinforce the most important concepts and need-to-know information after a training event without requiring a large time commitment from learners. While learners should refer to your performance support tool when they need to look something up, the knowledge you need them to recall from memory should be frequently reinforced in small chunks. Microlearning is highly effective for training reinforcement, but don’t let the hype deceive you: it isn’t always the answer. We designed Knowledge Guru’s new Drive app with this use case in mind. 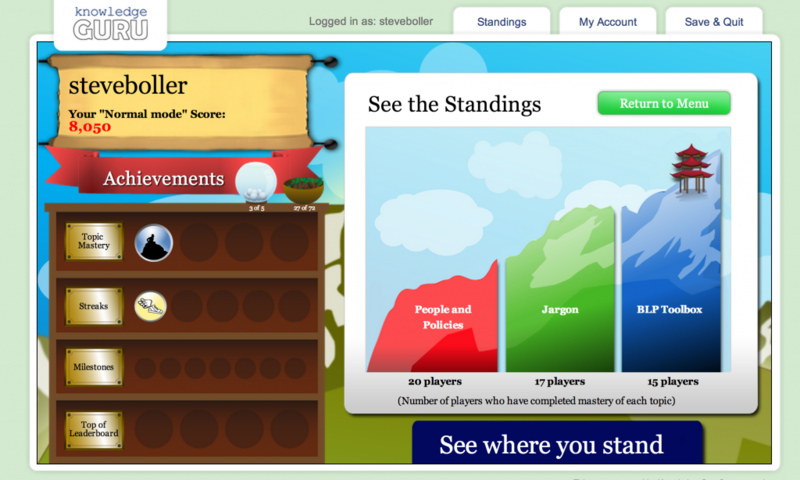 The app delivers customized daily mini-games to learners on their mobile devices. Each play session takes only five minutes to complete. While many organizations still deliver the majority of their training on computers, most of us do the lion’s share of online tasks on mobile devices. Even if your primary training event takes place on a desktop or in a classroom, chances are high that at least part of your reinforcement strategy will involve mobile delivery. A sound training needs analysis will help you identify the delivery method that is most useful to your learners. Coaching is the most “old school” of all the methods I’ve described. It still works, and in many cases, it is the most impactful training reinforcement method of all. The question should not be “should we coach?” but rather “who will coach and how will we make our coaches successful?” In many cases, the folks who you need as coaches are some of the busiest people in your organization. It’s important to give coaches the support, tools, and technology they need to succeed. A variety of learning technologies exist to make coaches better at what they do. For example, the dashboard in one of our Knowledge Guru apps allows coaches to see how a learner’s confidence compares to their actual performance level on different topics. Arming coaches with relevant data is one way to help coaches be more successful in their role. Trainers could learn a great deal from marketers. Six years in a marketing role have taught me that messages need to be clear, concise and repeated often. Trainers who see the best results from our Knowledge Guru platform put on marketing hats when they roll out their programs. A consistent theme, mixed mediums, timely emails, and easy-to-find hyperlinks to the relevant material are essential. Contests and competitions, when implemented well, make learners more likely to engage. We all know in our heart of hearts that we need insurance. I think we also know that training as a one-time event doesn’t work. Training reinforcement is the answer… and it’s more than a nice-to-have. You’ve seen us write articles and publish white papers on the science of remembering for well over a year now. We are big believers in the spacing effect, and using what we know about the brain to enhance what people remember. Doing so has a measurable impact on employee retention from training, among other things. It seems the New York Times has taken interest in spaced repetition as well. In a weekend editorial titled “How Tests Make Us Smarter,” Dr. Henry Roediger discusses how testing can be used as a valid tool to promote learning. Specifically, testing requires learners to retrieve knowledge from memory. According to Roediger, knowledge is solidified in our working memory when we practice retrieving and using it. Retrieving knowledge from memory is more beneficial when practice sessions are spaced out so that some forgetting occurs before you try to retrieve again. The added effort required to recall the information makes learning stronger. It also helps when retrieval practice is mixed up — whether you’re practicing hitting different kinds of baseball pitches or solving different solid geometry problems in a random sequence, you are better able later to discriminate what kind of pitch or geometry problem you’re facing and find the correct solution. While Dr. Roediger’s OpEd is specifically focused on testing students, the key points are applicable to corporate learning as well. In our Primer on Spaced Repetition and Feedback Loops, I connected the challenge of remembering to the constant effort organization’s expend to deliver information employees need to know for their jobs. Rather than test scores, a great deal more is at stake. Organizations depend on their training to help employees have less accidents, make more sales, provide better customer service and make fewer mistakes. Just like in the K-12 environment, the most common corporate learning methods are actually the least effective for learning when we take a look at the research. “Click next” eLearning courses, instructor-led sessions and PowerPoint slides are simply not enough to foster long term retention. For this reason, we consistently integrate spaced repetition and feedback loops into both the custom learning solutions we develop and into the design of our Knowledge Guru game engine. We work with our customers to help them integrate Knowledge Guru games into a larger curriculum to maximize the retention benefits. New employee on-boarding is hard on both the new hire and the manager. Most companies have a metaphorical onion of jargon, policies, procedures, and culture mores, and it can take weeks or even months for new employees to feel comfortable and be productive. Large organizations have a dedicated HR department that updates the policies and procedures these employees need to know… and there are probably quite a few of them. Small organizations may not even have an HR department, leaving it to the new employee’s manager to get them everything they need quickly. Even companies with a well-developed “Corporate University” or fleshed out on-boarding program run into problems when new hires fail to remember what they learned in those introductory courses and sessions. Without proper reinforcement and spacing of key concepts, new employees will quickly forget the flood of new information. Instructor-led sessions and eLearning courses, even when well designed, fall short in driving true retention. New research has shown that Ebbinghaus’ famous Forgetting Curve, which can approach 90% in lost information, is dependent on prior skills and experience. Learners with a prior framework for the new knowledge may only forget 30% without reinforcement, for example. Since new employees are usually new to the company, they are likely to fall closer to that 90% level of forgetting. When the policies and procedures actually matter, this becomes a huge problem for organizations to solve. Our solution? Use our Knowledge Guru game engine to create a “BLP Guru” game to teach process, procedures and jargon! 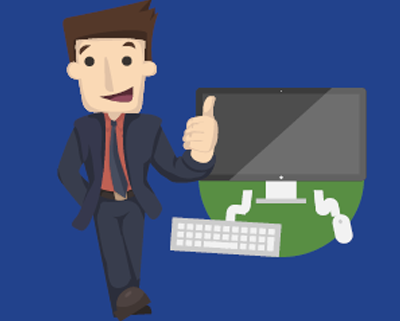 Employee on-boarding information is well-suited for the spaced repetition-based game engine. 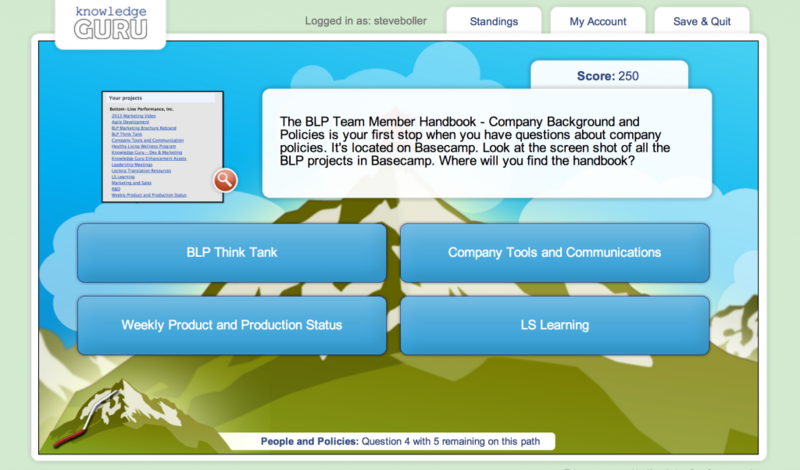 Our game covered policies and procedures, jargon and the “BLP Toolbox.” We wove workplace scenarios into all the topics. New hires review the handbook, then play the game with handbook close by. The game reinforces concepts that may have been explained by a manager and also teaches new concepts. 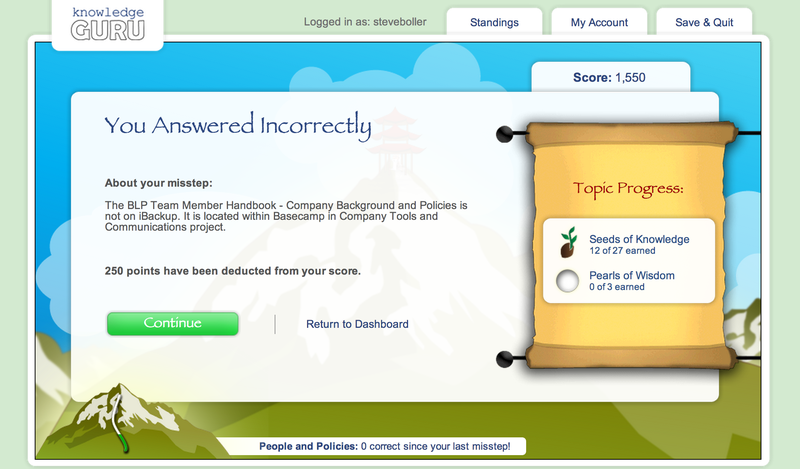 The feedback provided for incorrect responses helps employees avoid embedding incorrect information. The iterative questions and spaced repetition reinforce key learning objectives we identified as essential for all new hires to know or do. When job titles, tools and policies change, we are easily able to update the game content (or change to a new game entirely) in the admin dashboard. 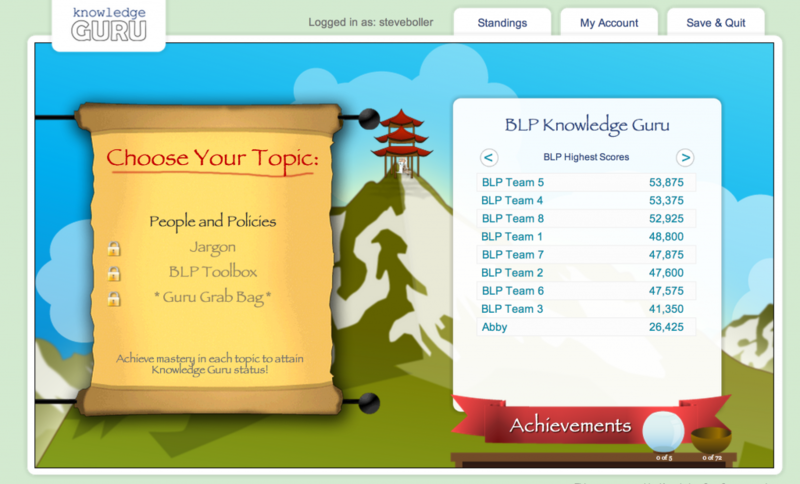 Scroll through the screenshots below to see some highlights of the BLP Guru Game. You can also request a demo for a complete walkthrough of how to use Knowledge Guru in an employee on-boarding program. Basic policies and procedures work well within Knowledge Guru games. Images can be combined with relevant questions, such as this “find and locate” question. Players learn from their mistakes and receive feedback when they answer questions incorrectly. Rewards and achievements make otherwise dry content motivating. 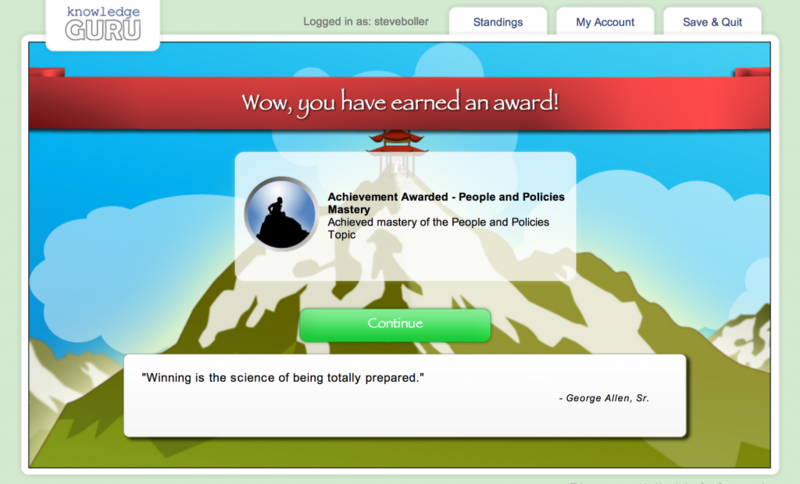 Players receive badges and topic mastery achievements when they complete on-boarding topics. The “See the Standings” page shows where all new hires have progressed in the game. The leaderboards build camaraderie, too. When the policies and procedures inevitably change, the game content is easy to update. 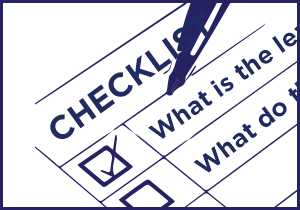 In some organizations, training is a “check the box,” “we’ve always done it this way” activity. That may work in some situations, but what about when remembering really matters? Corporate learning professionals need strategies to improve both knowledge transfer during the initial learning event as well as the rate of long-term retention. 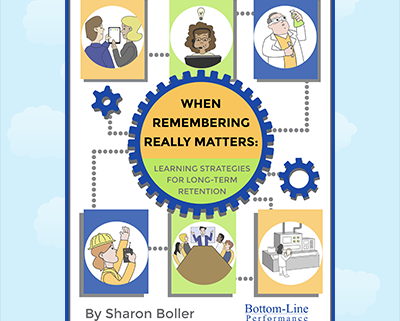 Sharon Boller, Knowledge Guru creator and Chief Product Officer, has authored a new white paper on strategies you can use to help learners remember. It includes the learning and remembering strategies used in Knowledge Guru alongside other strategies we use time and again in our custom solutions. Most importantly, you’ll find five unique business challenges in the white paper… and the strategies we used to solve those challenges for our clients. The white paper is available as a free download in the Learning Center on our Bottom-Line Performance website. Click here or click the image below to download the white paper. Apply research-based strategies for both learning and remembering into your own learning designs. Effectively use Knowledge Guru as a tool to increase learner retention. Ensure any solution you implement at your organization is backed by research-based learning principles. Knowledge Guru’s game engine is designed to tap into two powerful and empirically supported instructional strategies—Retrieval Practice and Spaced Retrieval. Spaced Retrieval avoids two inherent problems with mass practice (learning all the information at once); the problems of learner fatigue and the likelihood of interference with preceding and succeeding learning. So How Effective is Spaced Retrieval and Retrieval Practice? Additionally, using the combination of a quizzing game and online lectures, student’s minds will focus more on the course and wander less, which is always an issue in online learning. Researchers have found that by interspersing online lectures with short tests, student mind-wandering decreased by half, note-taking tripled, and overall retention of the material improved. As the researchers indicated, “In our experiments, when we asked students if they were mind-wandering, they said yes roughly 40 percent of the time. It’s a significant problem.” But using online quizzing in a manner such as Knowledge Guru will reduce mind wandering and increase performance. The results showed that the tested students took more notes during the lecture and also reported that their minds wandered less (19% as compared to 40%). In addition, the students who were tested on all segments outperformed both of the other groups (Tested = 90%, Restudy = 76%, Non-tested = 68). Another finding was that students who were tested after each segment indicated that they were less anxious about the fourth test than students from the other two groups. The researchers believe that the testing at the end of each segment acts as an incentive for students to pay closer attention. It’s more important to pay attention if they know they’ll have to answer questions at the end of each segment. Larsen DP, Butler AC, Roediger HL 3rd. Repeated testing improves long-term retention relative to repeated study: a randomized controlled trial. Med Educ 43: 1174–1181, 2009. Dobson, J. L. (2013) Retrieval practice is an efficient method of enhancing the retention of anatomy and physiology information Advances in Physiology Education 37: 184–191, 2013; doi:10.1152/advan.00174.2012. Roediger, H. L., & Butler, A.C . (2013). Retrieval practice (testing) effect. In H. L. Pashler (Ed. ),Encyclopedia of the mind. Los Angeles, CA: Sage Publishing Co.
 Carpenter SK, DeLosh EL. (2005) Application of the testing and spacing effects to name learning. Applied Cognitive Psychology 19: 619–636, 2005. And Cull W. (2000) Untangling the benefits of multiple study opportunities and repeated testing for cued recall. Applied Cognitive Psychology 14: 215–235, 2000. And Cull W, Shaughnessy JJ, Zechmeister EB. (1996) Expanding understanding of the expanding-pattern-of-retrieval mnemonic:toward confidence in applicability. Journal of Experimental Psychology Applied 2: 365–378. Kapp, K. M. (2012) The Gamification of Learning and Instruction: Game-based Methods and Strategies for Training and Education. New York: Pfeiffer.